We sort of knew it was coming but we were kinda hoping against hope Microsoft would just kill it before it got started. They didn’t and today, as of the AllThingsD conference, it is official. The specs: 3.3-inch, 480 x 272 OLED capacitive touchscreen display, built-in HD Radio receiver, HD output (utilizing a new dock — not on-board) and it looks like we thought (unfortunately). REDMOND, Wash. – May 26, 2009 – Microsoft Corp. today announced the evolution of Zune, the company’s end-to-end music and entertainment service, to a new platform and new markets. Zune will extend its video service to Xbox LIVE internationally this fall. This marks an important development in the Zune strategy and brings the Zune brand to more than 17 million international Xbox LIVE subscribers. 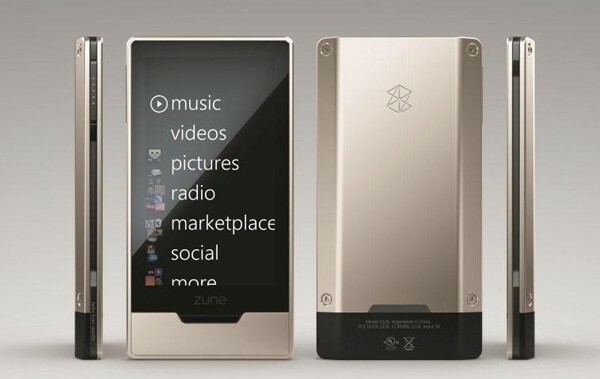 In addition, Microsoft confirmed the next generation of the Zune portable media player, Zune HD. Available in the U.S. this fall, Zune HD is the first portable media player that combines a built-in HD Radio receiver, high-definition (HD) video output capabilities, organic light-emitting diode (OLED) touch screen, Wi-Fi and an Internet browser. "The Zune music player is an integral part of the overall Zune experience, and we’re proud to be growing and extending our offering beyond the device," said Enrique Rodriguez, corporate vice president of the Microsoft TV, Video and Music Business Group. "Delivering on Microsoft’s connected entertainment vision, this news marks a turning point for Zune as it brings cross-platform experiences and premium video content to living rooms around the world." The bright OLED touch screen interface allows users to flip through music, movies and other content with ease, and the 16:9 widescreen format display (480×272 resolution) offers a premium viewing experience on the go. Zune is Microsoft’s music and entertainment brand that provides an integrated digital entertainment experience. The Zune platform includes a line of portable digital media players, elegant software, the Zune Marketplace online store, Zune Pass music subscription service, and the Zune Social online music community, created to help people discover more music. Zune is part of Microsoft’s Entertainment and Devices Division and supports the company’s software-based services vision to help drive innovation in the digital entertainment space. More information can be found online at http://www.zune.net/en-us/press. Xbox LIVE connects more than 17 million members across 26 countries to each other and the entertainment they love. Home of more content from one remote than can be found from any device connected to the television, Xbox LIVE is also a unified online social network bringing friends together, no matter where they are – in the living room or across the world. More information and Xbox LIVE membership can be found online at http://www.xbox.com/en-us/live. * Supported 720p HD video files play on the device, downscaled to fit the screen at 480 x 272 – not HD resolution. Zune HD and AV Dock, and an HDTV (all sold separately) are required to view video at HD resolution.